US Secretary of state, John Kerry, said this Friday that Washington “follows with interest” Morocco’s openness onto Africa “under the impulse of the King Mohammed VI”. Speaking at the opening of the 2nd session of the Morocco-US strategic dialog which he co-chaired with minister of foreign affairs and cooperation, Salaheddine Mezouar, recalled, in this context, the recent tour of Moroccan Sovereign the King Mohammed VI to Mali, Cote d’Ivoire, Guinea and Gabon, and the cooperation agreements signed during this travel. Stressing that the Kingdom is an engine for prosperity and security in the Maghreb and the African continent, the US office said Morocco is an entry port to this part of the world. 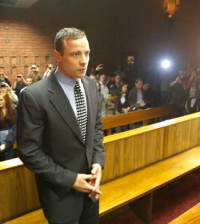 The trial of South African Paralympic champion Oscar Pistorius opened in Pretoria on Monday.